Your natural tooth is composed of two important components – the white, attractive crown that everyone’s familiar with, and the root hidden beneath the gum line. The root is a well-kept secret, but it provides essential stimulation and support to your jawbone. 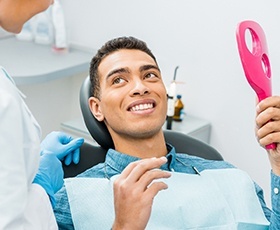 Traditional tooth replacement options only bother with replicating a lost tooth’s crown, which is good for aesthetics but not ideal for the patient’s continuing oral health. The bone will gradually deteriorate over time, and many of these patients end up with a “hunched” facial appearance in time. That’s why Davidson Dental Associates strongly recommends dental implants! 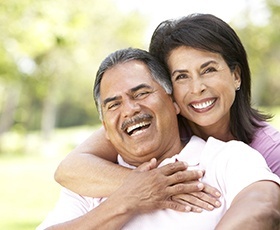 Dental implants seamlessly replicate every part of a natural tooth, starting with the root for an enduring foundation. They’re beautifully lifelike, highly durable, and will last for many years to come. Better yet, Dr. Davidson and her team can perform every step of this transformative process right here in our Washington, D.C. office – minimizing the travel to outside specialists. Please contact us today to schedule your first implant consultation. If you have lost a single tooth, our team can seamlessly replace it with a dental implant. After the implant has been surgically inserted into the tooth’s original socket, patients will undergo a period of healing. During this time, the natural tissue and bone will form around the biocompatible implant, creating a sturdy foundation for the restoration. Finally, Dr. Davidson will design an all-ceramic dental crown to fit over the implant. The tooth will be fully restored, and natural teeth nearby will not be harmed by this process. Have you lost multiple teeth? If so, an implant-retained bridge could be the best choice for replacement. Our team will place dental implants on either side of the space and then (once they’ve healed) attach the custom-made restoration over them for an attractive and strong result. Dr. Davidson prefers this reconstructive method to traditional bridges, which require healthy teeth to be filed down to accommodate dental crowns that work as the “anchors” instead. Implant-retained dentures, like their age-old counterparts, are designed to replace a significant number of missing teeth. This type of prosthetic is more cost-effective than replacing each tooth with its own personal implant, as it will only require a small number of placed implants to anchor the full denture in place. Hybrid dentures are permanently fixed within the mouth so that they function just like natural teeth; alternatively, patients may prefer overdentures, which are designed to maintain the convenient removability of traditional dentures. 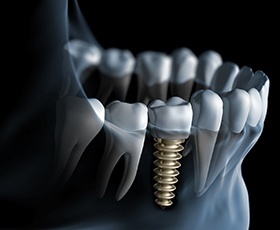 One of the biggest requirements of undergoing dental implant placement is that there needs to be a healthy amount of bone in the surgical site. Unfortunately, patients who have been experiencing tooth loss for several years may discover that they fall short of this goal. Thankfully, our office offers mini dental implants as a successful alternative. 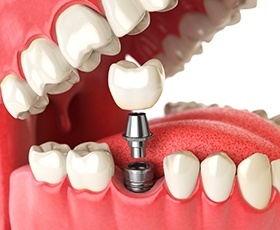 Like the name implies, mini dental implants are simply a miniature version of the traditional implant, and they can be placed in much shallower areas of bone structure to support implant-retained dentures.